I saw this one at the theater, as a kid, when it came out. I have searched for a VHS copy of this one for years, and finally came across it recently on the internet. It is no wonder that this one stayed with me for so long. 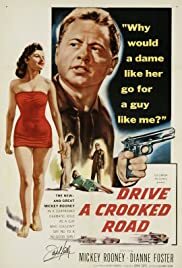 This is without a doubt Mickey Rooney's best movie as an adult. It would seem that after the war and the Andy Hardy series wound down that Mick was having a difficult time finding his niche in Hollywood. He did score very well with "Quicksand"(1950)but in this one he pulls out all the stops. Constantly he is referred to as "the little freak" and several comments are made concerning his manhood, or lack thereof. We slowly watch as Mick is played off by the gangster's moll, lured into the web of robbery and deceit; this is NOT a pretty movie. The movie builds slowly to an unforgettable, unexpected climax. Still a great movie after almost 50 years!